From HMRC on Wednesday: "Monthly summary of HMRC Tax and NIC Receipts (republished on 1st July to correct an error within the Child and Working Tax Credit figures)" that can be found here. Every month HMRC publish a report and table of how much they have taken in from different taxes in the previous month and how much they have paid out in tax credits and child benefit. The figures for the most recent twelve months are marked as 'provisional' and they are sometimes revised. Unusually, the report covering receipts and payments for May 2015 had replaced twelve months' previous figures for tax credits payments, increasing them by £85-90 million a month from April 2014 to February 2015 and by £140 million for March 2015. The figure for April 2015 was unchanged. The overall effect was not insignificant, amounting to £1.1 billion. No reason was given for these revisions in the report. "This revised version of the 19 June 2015 publication is necessary due to an error within the original. 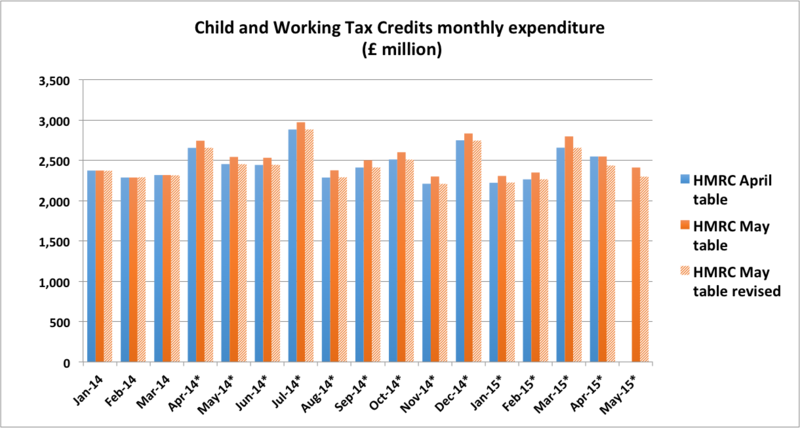 The error was caused by a coding issue which has now been corrected and only affects the Child and Working tax Credits figures in the table. There was no issue with the underlying data." Well it's good to know that the underlying data was correct, and that the only issue was that it was incorrectly reported. Nonetheless, looking at what must be assumed to be now correctly-reported figures, it can be seen that for April 2014 to March 2015 they have reverted to the amounts previously reported in the release for April. But for April 2015 they are lower than in the release for April and the original release for May, and for May 2015 they are lower than in the original release for May, in each month by £111 million. 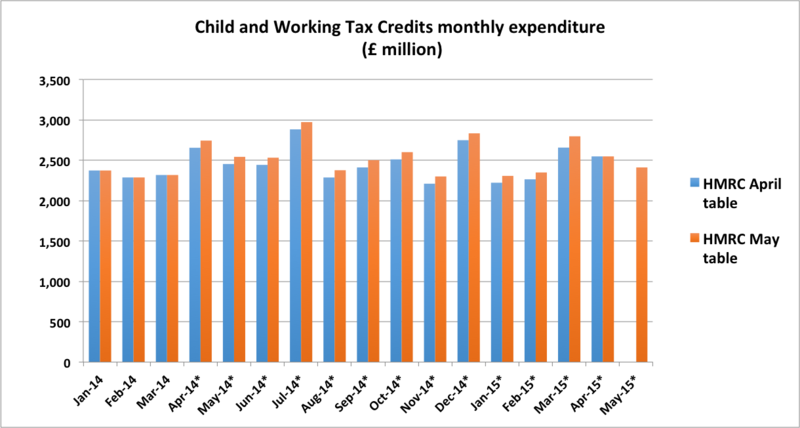 That's £222 million less paid out in April and May 2015 than previously stated, making the amount paid in tax credits £370 million less than in the same two months of 2014.